I haven't made much Christmas candy this year, but I made these caramels yesterday. The recipe is from the cookbook Pärlans Konfektyr. 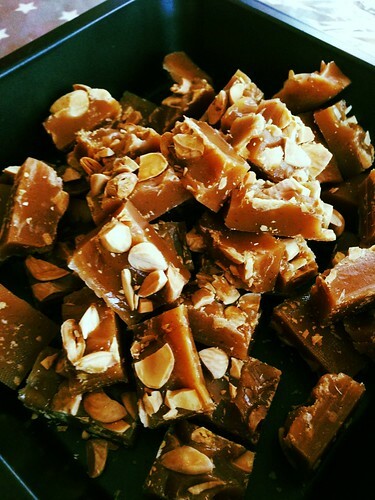 Pärlans make the best caramels (for sale) I've ever tried so I was pretty excited to try their recipe. Their cookbook came out earlier this fall, and since their caramels are pretty pricey, it's a good deal to make your own. And not hard - but a little scary, since you're dealing with super-hot temperatures. You need a good thermometer - I'm really happy with my Thermapen by the way! The cookbook has loads of caramel flavors, but I thought I'd start out easy with a vanilla-almond combo. Since it turned out so nicely, .I need to try more - maybe Cinnamon-Whiskey? I have to figure out a good way to wrap them though. I used cellophane and tape this time, but it was quite a chore. Any ideas? How do you wrap caramels? Cook the sugar and glucose until lightly golden - 170°C. Meanwhile, gently heat cream, vanilla, salt and butter in a small saucepan, on low heat. When the sugar reaches the right temperature, add the cream mixture to the sugar pot. Careful, careful - it'll be super hot and bubble a lot. Stir, carefully, and then heat again. It should reach 123°C. Pour into a lined tin (mine is 8 by 8 inches / 20 by 20 cm, which was pretty perfect.) and then sprinkle with the toasted almonds. Let it set for at least few hours or overnight. Cut into small caramels, and wrap individually. Jag har använt bakplåtspapper (smörgåspapper funkar säkert också bra), tycker det är lättare än plastfolie/cellofan. dessa verkar underbara. de ska jag verkligen prova. vilken härlig blogg du har.